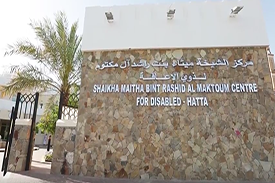 In reflection of the interest expressed by the patron HH Sheikh Hamdan Bin Rashid Al Maktoum and his son Sheikh Rashid Bin Hamdan, AMF Chairperson, the foundation took the responsibility to manage Sheikha Maitha Center for Children with Special Needs. The center is highly equipped with all what it takes to provide the best educational and clinical care to children with special needs at the highest international standards. To provide health, psychological and educational care. To provide schooling, religious and cultural care. To progress various talents shown by children with special needs. In addition, AMF provides generous support to needy families, orphans and widows through several service centers across the nation run and managed partially by Bait Al Kheir Charity (BKC). The second of the AMF centers was established in 2003 and covers the areas of Lehbab, Awir, Khawaneej, Mizhir, Mishref, Warqa, Rashidia, Nad Hamar, Mirdif, Oud Matina, Silicon Oasis, Dubai World, Ras El Khour in addition to Al Mudam in Sharjah. A total of 44,336 families, orphans and kids with special needs were serves with a total of AED 46 million over the past 6 years. Another center that started in 2003 and covers: In the Emirate of Dubai Sair, Sheila, Salmi, Nadi, Old Jeema, New Jeema, Old Hatta, New Dhahra. In the Emirate of Sharjah: Um Assafa, Bin Hweidin, Wishah 1 & 2, Tel Ezaafaran, Sala, Khatmah, Mleihah, Hamda, Fayah, Al Dheid, Falaj Almualla, Khdeirah, Breir, bahayes, Mhafez, Mudam and Wadi Helow. In the emirate of Ajman, the Hatta Center covers: Hadaf, Mzerei, Masfout, Khanfariya and Khanfariya 2, Sbeighah, Wargah, and Wargah 1, Sharyeh, Mansourah and Fay. In Ras Al Khaimah: Wadi Esfani, Kidra, Mamdouh, Shoukah, Khdeirah, Safi, Wadi El Gour, Wadi El Menai, Skheiber, Ashaabiya Alhamra, Rafag, Hweilat, Fashgah, Waab, Mallah, Kharroum, Naslah, Wadi Alyeeli, Mnei, and in the emirate of Fujairah: Kalba, Manamah and Ouhlah. A total of 33,195 families, orphans and kids with special needs were serves with a total of AED 33 million over the past 6 years. The fourth center that started in 2003 provides charity services for citizens of the emirates of Dubai and Abu Dhabi. In Dubai, it covers the areas of Jumeirah (1 to 5), Um Suquiem, Al Barsha (1 to 3), Southern Barsha, Qouz, Satwa, Wasl, Bidaa, Jafliya, Mankhoul, Shurta, Difaa, Karama, Zaabil, Muneera and Safa. In Abu Dhabi, it covers from Samha to Western Region, Selaa and Marfaa. A total of 65,330 families, orphans and kids with special needs were serves with a total of AED 62 million over the past 6 years. Established in 2003, this is the first of AMF/ BKC joint charity centers, and covers the areas of Leasli, Fuga’, Mirguib, Royya and Al Ain. A total of 11,651 families, orphans and kids with special needs were serves with a total of AED 15 million over the past 6 years.